When I was a kid I really wanted to know what Pink Floyd sounded like. Everyone I saw wearing a Pink Floyd shirt was a freaky looking dude with long hair. I guessed Pink Floyd must be the heaviest and loudest band in the world. When I started my journey into Floyd music with the The Wall, I was straisurprised that it isn’t loud at all. In fact, I needed to put on headphones and listen carefully to try and work out what all the odd little sounds in the distance meant. It was different than any kind of music I’d heard before, or since. So I bought Delicate Sound of Thunder next, figuring that another double album was the way to go. This live album introduced me to songs from the next two albums I would get: Dark Side of the Moon and Wish You Were Here. Where Did Pink Floyd Come From? Pink Floyd formed in London in 1965 when Syd Barrett moved there from Cambridge. He joined fellow musicians Nick Mason, Roger Waters and Rick Wright and their first album, The Piper at the Gates of Dawn, was released in 1967. It reached No.6 in the UK charts. Due to increasingly erratic behavior, Barrett would only remain with the band for another year. He was replaced by guitarist David Gilmour in 1968. The band spent the next few years recording film scores and albums that sounded more like psychedelic experiments. The group came into their own with the stronger emphasis songwriting and large themes on Dark Side of the Moon in 1973. It was the band’s first big commercial success, and they followed it with Wish You Were Here in 1975 and The Wall in 1979. During these years bassist Roger Waters exerted more creative control over the band. While each member of Pink Floyd can be found with songwriting credits on Dark Side of the Moon (Mason has a credit on “Time”) and Wright has numerous contributions on Wish You Were Here, Waters is the principle songwriter on The Wall, although you will find Gilmour collaborated on the music of Young Lust, Run Like Hell, and Comfortably Numb. This phase culminated with Waters being the sole credited songwriter credit on the 1983 album The Final Cut, which proved to his last record with the band. David Gilmour’s distinctive guitar style is often regarded as the most familiar aspect of the Pink Floyd sound. It’s instantly recognizable for its economy and tone and his gift of melodic phrasing is still influencing guitarists all over the world. The first band to include Roger Waters, Richard Wright and Nick Mason was called Sigma 6. They were joined by Waters’ childhood friend Syd Barrett in 1964. They changed their name to Tea Set. That name lasted until they discovered another band with the same name was going to playing at one of their gigs! 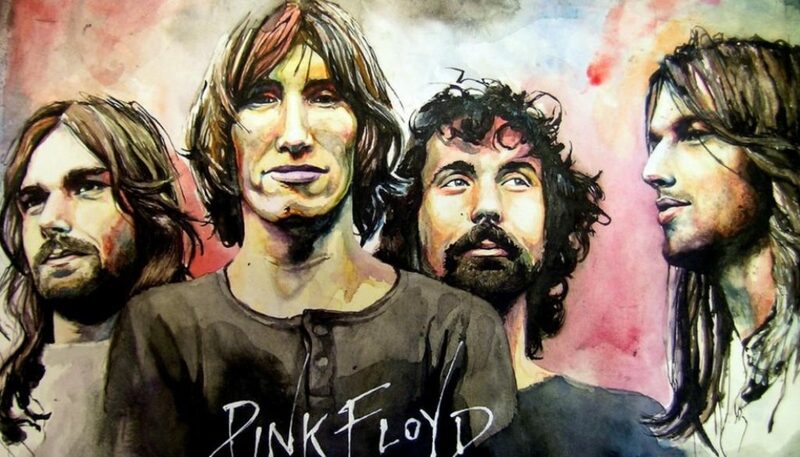 Barrett quickly changed the name to Pink Floyd, deriving the name from two blues musicians whose records Barrett had in his collection, Pink Anderson and Floyd Council. Guitar Noise has several Pink Floyd guitar lessons. For the solo acoustic guitarist there is a two part lesson on Wish You Were Here. The first part of Wish You Were Here gives beginners a step by step lesson on getting the strumming pattern to sound natural. Part two picks up where the first part leaves off. It’s aimed more at intermediate players and shows you how to deal with with the intro solo. The solo at the beginning of Wish You Were Here uses four basic guitar techniques you should know: hammer-ons, pull-offs, slides and bends. More ambitious students might like to look at Wish You Were Here arranged for two guitars in the lesson Applied Science. While actually a lot simpler than it sounds, this lesson covers alternate tuning, alternate chord voicings and basic leads and fills. Absolute beginner might want to take a stab at Brain Damage / Eclipse from Dark Side of the Moon. This lesson takes very basic chords and adds a very simple strumming and picking pattern. Those interested in alternate tunings and a challenge should take a look at the lesson Cover Story. This lesson looks at how to use alternate tunings as a tool for arranging imaginative versions of people’s songs and coming up with wild interpretations of old familiar tunes. Included is a solo acoustic version of the Pink Floyd song Take It Back. Students of the bass guitar will want to try out Money – Bass Guitar Lesson. Learning how to play this classic Pink Floyd song is as easy as counting to seven (and occasionally eight)! Comfortably Numb is one of the highlights from The Wall and we have arranged it for a single guitar, using many strumming and crosspicking, techniques we’ve gone over in our podcasts. If you’re going to play an emotionally charged song like this, you can’t hide behind a single strumming pattern. We’ll show you how to make a great sounding version for one guitar.